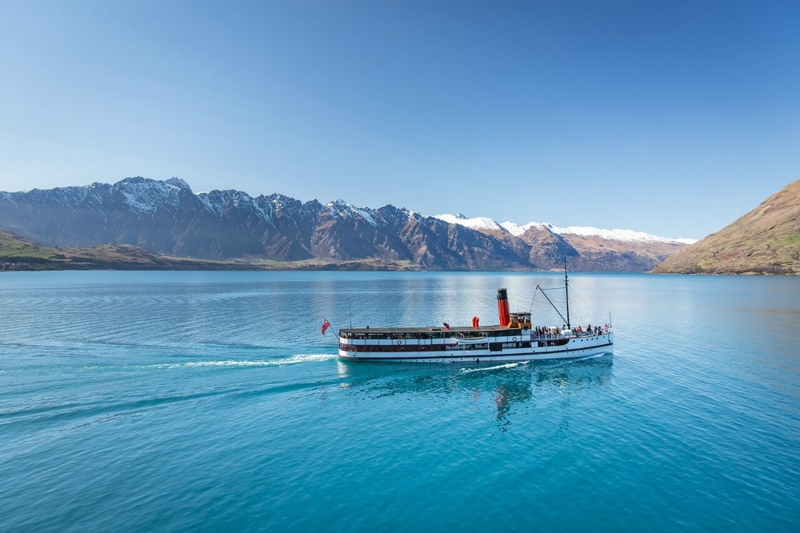 The 90-minute cruise departs from Steamer Wharf and provides spectacular views of Queenstown's incredible alpine scenery. On board, guests can purchase food and drinks from the Promenade Cafe and enjoy the music from the onboard pianist. The TSS Earnslaw is more than 100 years old, and photographs and information located around the vessel explain more about its history. There's also a chance to see the engine room and observe the giant coal-fired engines at work and visit the bridge. If you would like to extend your trip you can choose from a number of additional experiences at Walter Peak Farm, a high country working farm located in a sheltered bay once used as Maori camping grounds. Walter Peak Gourmet BBQ Lunch: Hosted in the Colonel's Homestead, the gourmet lunch features a seasonal menu with dishes made from fresh local produce. After the meal, you can enjoy a demonstration of life on the farm or explore the grounds on your own. Walter Peak Gourmet BBQ Dinner: Enjoy a trip on the TSS Earnslaw followed by a gourmet dinner with a seasonal menu and then find out more about life on the farm. The nighttime return cruise offers a different view of Queenstown with the lights of the town on show from the water. Walter Peak Horse Trek: Take a guided 40-minute horse trek across the grounds to lookout points with stunning views of the lake. Morning or afternoon tea is provided on your return, and there is also time to explore the grounds on foot. The trek is suitable for all abilities, even first-time riders. Walter Peak Electric Trail Bikes: Combine a cruise across Lake Wakatipu on board the TSS Earnslaw and our electric trail bikes. Explore the rugged back country terrain at Walter Peak High Country Farm. This is a fun small-group activity in stunning surroundings with great views across the lake and a chance to learn about the history of Walter Peak. Light refreshments included. Departures: Nov – Apr. Cruises depart regularly each day, weather permitting, all year round except for short periods of annual maintenance.